Sometimes here on Stars Over Washington I add links to very interesting tidbits in this blog's sidebar without shouting out their addition in a post. However, the 10th anniversary of the attacks of 9/11/01 has inspired me to post a link to a site which has a digital copy of a 1957 book by William R. Denslow entitled 10,000 Famous Freemasons and telling you about it. So even if you don't care to peruse the alphabetized list for names of famous politicians, presidents, Supreme Court Justices, Kings, Queens, and other notables, you may wish to check out the book's Foreward written by none other than one of our many Freemason presidents, Harry S. Truman. John Hancock, and others whose names you'll recognize--some may surprise you! But this is dusty old stuff, eh? 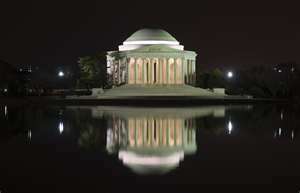 As with a District of Columbia studded with tomb-like buildings constructed on principles of Sacred Geometry (thanks to our Great Mathematician!) --the Capitol Building in Washington comes first to mind--this list of 10,000 names is a good resource for those investigating History yet who wish to unearth deeper informational layers rather than accepting the veneer that most historians tend to toss over their narratives. The more superficial tossing makes true understanding of past events, both consequences and causes, difficult if not impossible to determine though many researchers continually try. Well, given the destructive wind that a hijacked America has been heading into (probably timed by the take-over of the US government by The Federal Reserve Bank, circa 1913), I'd hide my name, too, if I were a member of a secret society that was itself hijacked centuries ago by an Illuminati determined to gain total world control, with America acting as its military branch. So are you able-bodied and unemployed for long? Guess you're tempted to join the US military, a very successful Employment Program the US government promotes in films, tv shows, in games, schools, and more--wherever the propaganda boot fits, our young people are expected to wear it. Check out Source Code for a not-so-subtle hint: serve your country even after death! This film (which I did like, btw) manages to tout military service and the fear of terrorism occurring on US soil simultaneously. So whose bio was I researching when I came upon the book? That of Thaddeus Kosciuszko, hero of the American Revolution, Freemason (he's on the list of 10,000), and bosom buddy of Thomas Jefferson, Freemason and Illuminati agent. You remember that it was master engineer Kosciuszko who bolstered our forts during the American Revolution and it was his plans that were sold to the British by Benedict Arnold. On the topic of America's reputed 'turning' from a higher course to a lower one of perpetual war, I sometimes I wonder: did the attacks of 9/11 mark a symbolic switch of America's Great Seal from obverse to the reverse side with its (Illuminati) Eye of Surveillance on top the 13-step pyramid or power? Related posts include Signposts on the NWO Highway and here's a post detailing the collapse of Lehman Brothers--in 1984--and the list of which organizations sit on each rung of the 13-Step Pyramid of Power. '13' is a big number in occultism, as you know. Our original 13 colonies, 13 steps of power, the 13th Amendment, Ophiuchus the 13th constellation, etc. And yes, I now sit typing from within the 13th Colony of Georgia. And you know that the number '13' is said to be a signature of the Illuminati and Freemasonry, right? "Keynote: The enduring power of occult knowledge and of its quasi-divine Custodians, "Seed-men" of a previous cycle of existence. The belief in an Original Tradition based on the perfect knowledge of the archetypal principles and forms which underlie all manifestations of life on earth (and by extension in the cosmos) is deeply rooted in man's consciousness. The Great Pyramid and the Sphinx are witnesses to such a Tradition, especially for the Western world. The symbol implies that such an archetypal knowledge remains the foundation upon which men's minds can still build solid and valid formulations, as new evolutionary developments are pending." Ancestry? Ancestor and hero worship? Well, with 'The Sphinx' we know as Thomas Jefferson intimately involved in the founding of this nation and his cosmic studies well known (if not his secret society connections), the centuries-long campaign which the US government has maintained to make certain that Mr. Jefferson remains for posterity a "quasi-divine" "Seed-man" (and a secretive holder of occult--hidden--knowledge such as the Bruton Vault info which he apparently suppressed), it may be easier to understand the degree's Egyptian flavor in light of the Sabian Symbol's babylonish implications. Plus, the architecture of the Jefferson Memorial has that certain dusty musty Masonic look about it, don't you agree? Update 9.12.11 7:46 pm edt: did you know that George Washington's Inaugural throne (April 30, 1789 Federal Hall on Wall Street, NYC) was decorated with a Rising Sun symbol? Or should I say 'is' decorated? Wonder who sits upon the booger now for its seems the Sun is setting.